CT1 multisolve is the ideal preliminary product for all sealants and adhesives, C-Tecs MultiSolve is a trade favourite for its ability to remove all kinds of persistent residues, oils, greases, glues, waxes, tars, and inks. Available in a handy 500ml aerosol can. 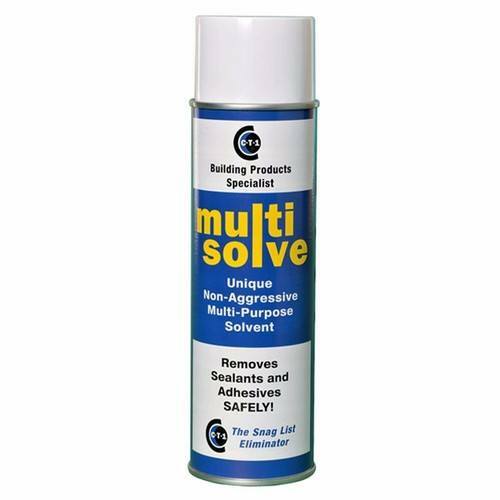 CT1 Multisolve is the ideal multi-purpose solvent for adhesive and sealant removal for tradesmen in almost every field, and is a favourite among plumbers, shopfitters, tilers, upholsterers, joiners, builders, signmakers, stonemasons, electricians, and many more. Simply spray multi-solve on the desired surface and within seconds it will begin to remove even the thickest and most persistant adhesives. Bought to remove adhesive from old frosting film stock to windows. removed everything with no problem. Just had some double glazing installed. The fitters were using a strong-smelling high VOC Solvent to clean the frames. I gave them some Multi Solve to try and they were amazed, called their office and placed an order! Simply the best and no headaches! Used to remove old silicone from a shower tray. Excellent product. It removed 100% of the old silicone, so easy to use. The tiles and tray were restored to pristine condition ready to re-silicone again. Thoroughly recommend this product. It does what it says on the tin. Would highly recommend this product.